Las Bardenas Reales has probably been, to me, one of Spain’s most surprising landscapes so far.Why did it take us so long to decide to go there? Thanks to Bellerose we fixed this situation. 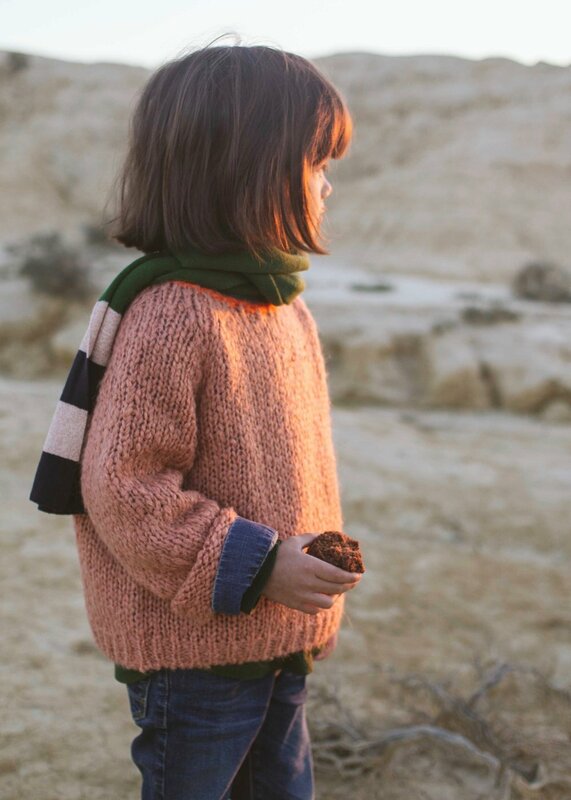 They gave me the opportunity to take pictures for their Autumn-Winter collection in the Aire de Bardenas hotel because it was a location they loved, and so we went and spent a couple of fantastic days, especially for the girls. Being able to sleep contemplating the stars, and waking up to see the sunrise directly from your bed is not something you get to do every day. The hotel has an interesting, futuristic vibe. It is sober, calm, and has a design and architecture that make it unique, even having bubble-shaped rooms that make you feel like you are on the moon. My favourite thing was the Parque Natural de las Bardenas Reales. 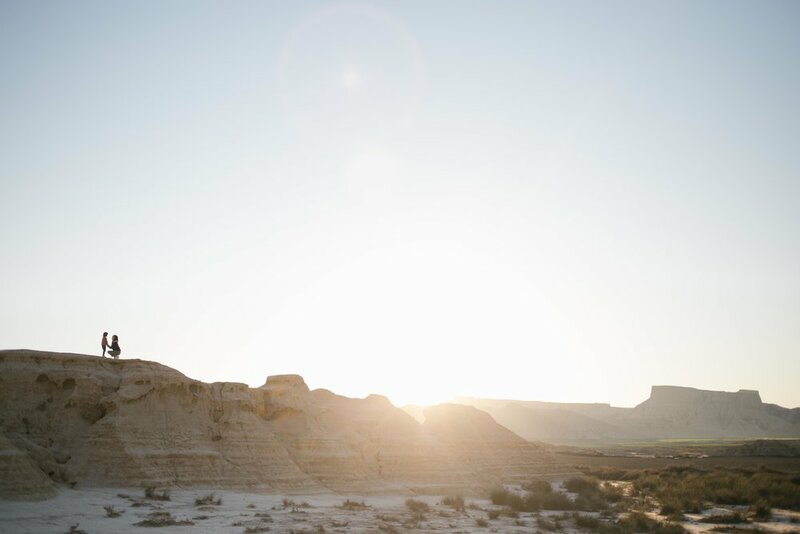 A landscape that reminds you of the American desert, but right here in Spain, which is located in Tudela, Navarra. Las Bardenas Reales were declared a biosphere reserve by the UNESCO, and they have a very unique charm, which is completely different to any place we had seen before. The first day we went down a cliff and trekked around the area, discovering caves and feeling like we were in an actual movie set. Since it was spring, the heat wasn’t too intense. We also toured around by car, since the area is very vast, making stops along the way to wander around by foot. The most memorable moment of this trip was waking up early to go and see the sunrise at Las Bardenas. I started the habit of waking up to see sunrises thanks to Álvaro Sanz, as you might already know. While this is something I might not do as a part of my routine, I believe that in a place like this the effort was worth it. There is nothing comparable to this type of experience, and we know our daughters won’t ever forget it. Seing the sunrise in the Bardenas landscape, completely alone, with the whole park for yourself gives you a sensation of freedom and peace that will never leave me. It was cold at the beginning, but we warmed up quickly with a bit of a walk. The views, the landscape, the moment are breathtaking. You should definitely try it out. Having a whole location like this for yourself only is a memorable experience. One of the most recognisable elements of Las Bardenas is Cabezo de Castildetierra, a natural monument that showcases the erosion and the passing of time in a location that is a real wonder of nature. Once we were back, we had a fantastic breakfast and a lovely day to relax, play and go with the flow. We love to enjoy this kind of trips, just the four of us, and I realise how good they are for us, because they bring us together so much as a family, so let’s hope for more travels like this one for the next year. Thank you Bellerose for your trust and your complete support.